The future of one of the world's most notorious prisons as well as its remaining detainees are at the center of a debate. Good evening. It is the controversial prison where the men the U.S. Government calls some of the world's most hardened terrorists are being held. Gitmo. One of president Obama's signature promises was to close Gitmo. But will he end up leaving that decision to his successor? 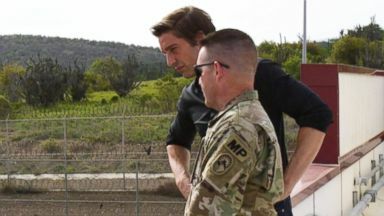 "World news tonight" anchor David Muir gained rare access. Fire, fire, fire, fire. Reporter: We fly to one of the most notorious prisons in the world. On the U.S. Naval base at Guantanamo Bay, Cuba. Since 9/11, nearly 800 detainees have been brought to Guantanamo. We're now on the sprawling naval base, 45 square miles. The only way to get to the detention center is by boat. We make our way to the prison. Driving through what looks more like a mini American suburb. Rows of colorful homes. A McDonald's. Even a high school. For the American families stationed here. We arrive at the detention center. The barbed wire. The Gates. Tonight, 19 more detainees have been cleared for transfer to other countries. It would leave just 41 left. Will they be brought to prisons here in the U.S.? Will the president's promise to close Guantanamo be kept? There was no single cell -- We meet the prison warden. He takes us down the darkened hallways of one of the camp's still open here, camp 6. So this is a typical cell block. Reporter: Some of the detainees still here at Guantanamo are the worst of the worst. Khalid shaikh Mohammed, accused mastermind of the 9/11 attacks. They show us many of the detainees who have been here more than 14 years. We are not allowed to show their faces. You can see they're getting ready for prayer. Some of them are, yeah. Reporter: We watch as the detainees use army mats for prayer. We can actually see the detainees, they cannot see us back through this glass. We just watch as the guards placed these Orange cones in front of the doors here. That's a signal to the other guards not to open the doors, not to disrupt them during prayer. We notice through the glass the fence, their own sign, prayer call. They turn it around when they're done. It can inflame tensions when they're making unnecessary noise. Reporter: There are so many signs of their daily routine here. Their laundry hanging, meals, detainees carrying cups and plates. We watched as one of the guards put on these face masks. Lessen the risk of them getting something put in their eyes or mouth. Reporter: He's talking about a cocktail of bodily fluids, blood, urine, feels seals. They call it splashing. They show us the kind of cell for detainees who protest, who are noncompliant. We see the evidence of the splashing on the ceiling. It does happen. Reporter: The colonel tells me there have been fewer clashes with the guards because he says many here sense they could be getting out. The state department is working very hard to find these detainees places to go. Are they ready to go? I think a lot of them are. Reporter: The U.S. Government says they have increased vetting. Now six agencies deciding which detainees are transferred. We're heading into the control room -- Attention! Carry on. Reporter: There are monitors inside and out. We see the rec yards. Once watching hundreds of inmates, there are now 60 detainees left. Do you have any idea how much American taxpayers are paying per detainee? No. I don't. I've got to be prepared for the worst-case scenario. Reporter: Tonight the state department says American taxpayers are spending more than $7 million per detainee every year. This is our pharmacy. Reporter: Those prisoners are aging. Americans paying for their medicine. This is for people who are aging in front of you? That is correct. I'll let you go first. Reporter: Then a rare moment. When was the last time you came up to the roof with cameras? I've never done this. Reporter: We approach the edge. We notice the track for exercise. Now a worn path through the gravel. We see them walking on treadmills. Then they start to yell our way. Hey, what's up, camera, I see you, shut it off, I'm going to Saudi Arabia! Reporter: A request. We need treadmill and ellipticals! Reporter: They take advantage of a rare moment to speak to the world. ABC news, tonight I watch the TV, put me on CNN news, ABC news -- They're aware. They are. You've heard Donald Trump say he wants to send more people to Guantanamo. I have. This morning I watched president Obama talking about Gitmo, Guantanamo Bay. Which by the way, which by the way we are keeping open and we're going to load it up with bad dudes, believe me, we're going to load it up. You did tell me there was progress here. Would it fight the progress you've seen? Well, bite certainly go against what we started. Reporter: 20 days now until the election. Hillary Clinton says she stands by the president's plan to shut Guantanamo down. Because of what it represents around the world. The history of torture. We are an islamic army. Reporter: Orange jumpsuits evoking Guantanamo, now used in ISIS recruitment videos. 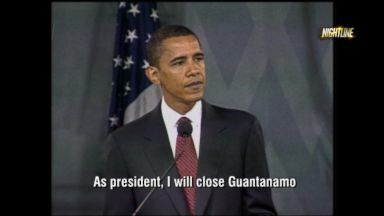 We heard from president Obama after he was elected the first time, close Guantanamo. There we go. Guantanamo will be closed no later than one year from now. Fearly eight years letter it's still open. Do you see a day when it closes? Absolutely. Reporter: The ambassador, U.S. Special envoy tasked with the effort to close Guantanamo. What do you do with the 41 left? If they're a safety risk, the worst of the worst as I don't have heard what do you do? There's no question Guantanamo houses some dangerous, hardened terrorists, including individuals who are responsible for the 9/11 attacks. What we intend to do is work with the congress to find a suitable facility in the united States. Excuse my French but we say hell no! Reporter: Near Florence, Colorado, at a town hall meeting, some of the Americans against it. We are at war. You have to have a place to put war prisoners. It's an invitation for an attack locally. Reporter: They live not far from one of the most secure super max prisons in the world. President Obama bringing detainees here -- Reporter: Outrage growing across the country. Two conservative radio hosts who call themselves the ameri-chicks helping lead the charge. It's serving its function well, that's why it should stay hope. We sacrifice so much to get these bad guys put away, there's no common sense in doing it. Families who live in these communities don't want high-risk detainees in their communities. They have in their communities already very hardened terrorists. They have Mr. Moussaoui, they have the shoe bomber, they have the underwear bomber. Reporter: So far, congress has blocked any move to bring any of the detainees here. What do you think of Americans who might say, move the detainees here, you're simply creating a Guantanamo in the U.S. It wouldn't be Guantanamo in the U.S. You'd have 40 detainees stuck here in the U.S. That's true. But there's an independent threat that Guantanamo itself presents. The image of Guantanamo forever is going to be of individuals in Orange jumpsuits and open air cages. Reporter: He argues not everyone at Guantanamo is dangerous. 711 detainees have now been transferred to 59 countries all over the world. Uruguay. Albania. Even bermuda. We traveled to bermuda to find Halil Mahmoud. He spent seven years at Guantanamo before being dropped off in bermuda. Halil? Reporter: He's lived here seven years. No passport, no papers, no way off the island. You'd never heard of bermuda? We heard about the bermuda triangle. Strange place. Where the people go and disappear. Reporter: Halil argues that's what's happened to him. In limbo here. And he says he never should have been at Guantanamo in the first place. I'm not terrorist, never ever. Innocent. We have done nothing wrong against U.S. Reporter: He tells us he was swept up after 9/11. He is a Chinese uighur, part of a Muslim minority group that escaped persecution by fleeing to the tribal areas of Afghanistan and Pakistan. During the war, the U.S. Military advertised bounties for suspected terrorists with leaflet drops like these. He was captured and sold to the U.S., labeled an enemy combatant. He was later cleared for release by multiple U.S. Courts yet he still sat at Guantanamo for seven years. Now in bermuda, married and raising two children. Unsure whether he and the three other detainees dropped off with him will ever be able to leave. No passport, nothing yet. You know, me and my sons, stateless. Reporter: In most cases the U.S. Government does ask receiving countries to monitor detainees and to restrict their travel. Are you still angry that you were brought to Guantanamo Bay? No, I'm not angry. Because when I left Guantanamo Bay, I left everything behind. Reporter: Unlike Halil, there are some released detainees who do turn to terror. In fact, a new government report reveals two more released detainees re-engaging in terrorism. A total of nine under president Obama. 113 returning to terror under president bush. When you see these new headlines that two more detainees are now involved again, what do you say to the Americans who say, this is simply too big of a risk? Well, it is a risk. However, you have to measure that against the risk of keeping the facility open. Reporter: But if it's closed, perhaps the biggest issue of all, what to do with the detainees deemed too dangerous to transfer? Colonel, you're aware this president has suggested there are maximum security locations in America back in the U.S. That could take the handful of prisoners who are left. True. Would you have any hesitation in doing that? No. These guys are no more dangerous than any of the prisoners we have in maximum security facilities in the United States. Already? Already. Reporter: Tonight the fate of this prison known around the world now lies in the hands of the American voter. With less than 100 days left of President Obama's term, a look back on his longstanding plans to close Guantanamo Bay. The future of one of the most notorious prisons is up in the air.